If you are able to spot one of these magnificent flying insects, you are one lucky person! And if you can get close enough to take a picture, then even better! These little guys are so quiet and hard to spot, you really have to keep a close eye out throughout your hike along the Wild Basin trail. It is also really important that if one of these bees get close to you, don’t swat at it!! Honey Bees are suffering from what we know as CCD, or Colony Collapse Disorder. This is a very real, and very severe syndrome that has killed millions of Honey Bees. 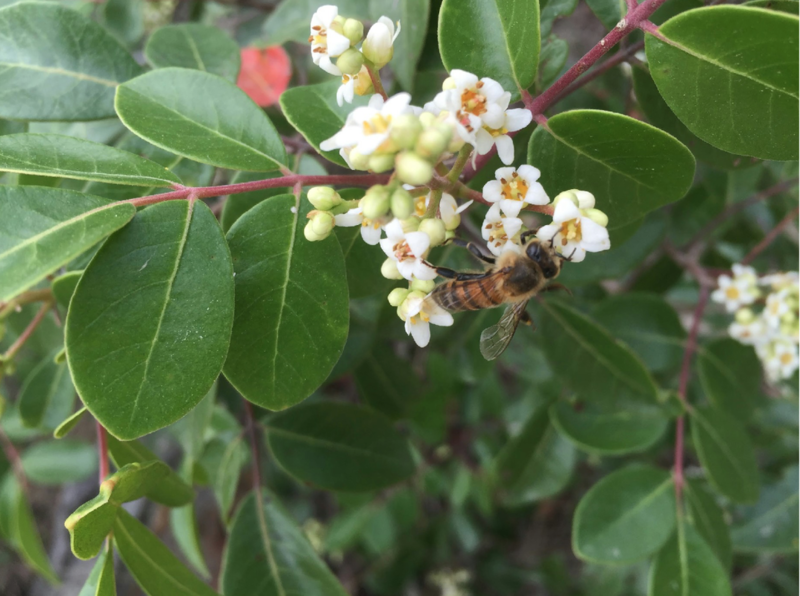 It is one of the biggest threats to keeping the population stable, and is problematic because Honey Bees are a major pollinator of Texas crops and plants. Although most people recognize the non-native Honey Bee, there are other bees native to Central Texas that are also present at Wild Basin, such as Leaf-Cutter Bees (Megachile sp), Mason Bees (Osmia sp), and Sunflower Bees (Diadasia sp). Unlike the Honey Bee, these species are solitary, as each individual female creates her own small nest. These solitary bees are much harder to spot as they are smaller than the social Honey Bee, but are just as responsible for the necessary pollination of crops and plants as Honey Bees are, making them an ecological necessity. Both native and non-native bees play a vital role in our ecosystem as they pollinate the crops we consume. If they were to go extinct, it would have detrimental impacts on our global population and what it would mean to sustain it. So, if you can spot one of these while you're out, make sure to admire from a distance and enjoy your hike!